Until I Rest in You focuses not on the quantity of the steps you are taking, but on the quality and purpose of their presence in the day to day. 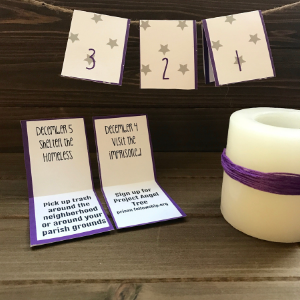 Each week focuses on the development of a specific virtue, with suggested applications for you and your kids. 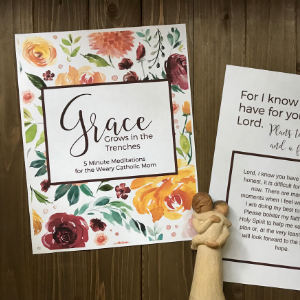 When you purchase Until I Rest in You, you will have weekly scriptural citations, points to ponder, and a season’s worth of suggestions for prayer, sacrifice, and giving alms. THIS IS A DOWNLOADABLE PDF FILE. UPON PURCHASE, YOU WILL BE DIRECTED TO THE LINK TO DOWNLOAD. ALL SALES ARE FINAL. 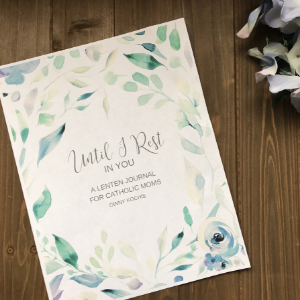 As the only Lenten journal designed to unite the journey of motherhood with Christ’s suffering and compliment the nature of family life, Until I Rest in You is simple, flexible, and focused on intentional Lenten observance.